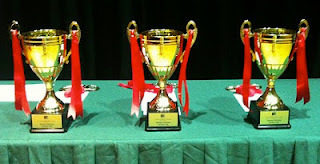 The 6th annual Readers Cup competition was held after school Thursday, May 21st, at the Singapore American School (SAS). This year we experimented with allowing up to two teams per school per category -- and consequently had over 40 teams from 12 schools participating. We also added two new ways to win: a Book Cover competition and a Book Trailer competition. Our sponsor this year was Closetful of Books and its owner, Denise Tan, had the honor of handing out the trophies to the first-place teams. A $500 donation of books from Closetful of Books & ISLN will be made in the name of each first-place winning team. The chosen charity is Book Reach, which focuses on school libraries and promoting literacy in Nepal. It was started by Doreen Johnstone, a former Tanglin teacher (and whose husband was a Dover UWC teacher). 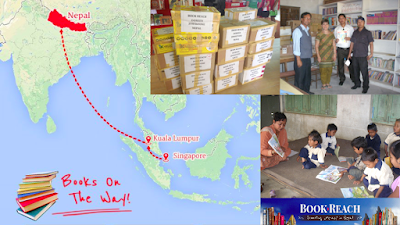 Doreen wasn't in Singapore at the time of our event, but she will visit each of the winning schools in order to explain her work in Nepal on behalf of children and school libraries. Many thanks to the SAS teachers/librarians -- Kate Brundage, Rosa Shin-Gay, and Scott Riley -- for everything they did to host the event. (Anyone interested in being the venue next year??) Barb Reid (UWC East) and Meg Johnson (AISS) were the other committee members who deserve special thanks. There is so much work that goes into an event like this. The Readers Cup committee is looking for new members for next year. Contact Barb Reid (bre@uwcsea.edu.sg) if you are interested -- or if you have questions or feedback about this year's event.